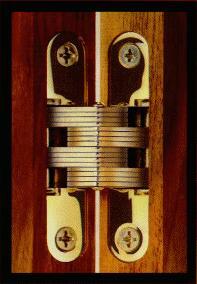 SOSS Door Hardware has been supplying fine door hardware since 1903! The flagship of their door hardware line is their extensive line of invisible hinges in standard wood and metal cabinet applications, fire-rated and stainless steel styles! They also offer Invisible Spring Closer Hinges, Magnetic Door Holder and Stops, Reinforcements for Metal Door Applications, Barrel Hinges and Quadrant Hinges.